For those of you hooked on Instagram we are sure like us you will have seen the large number of Instagrammers sharing their 2016 Best Nine photographs on their accounts. Hookedblog haven’t posted one yet as narrowing the selecting down to just nine photographs for us was just a little too difficult. 2016 saw us take a huge amount of photographs from our wanderings around London and beyond over the year. Those of you following our Hookedblog Instagram will have also seen some of the #HookedblogOnTour adventures and stories we shared with you throughout 2016. Our travels and adventures over the last twelve months have seen us visit 8 countries and 13 different cities taking in amongst other things some of the best street art these locations had to offer. As we look back on the year we wanted to share a selection of these photos from an awesome year of travel so here is our selection from 2016. No:15 — Night-time views of this Ella & Pitr work in Stavanger, Norway. No:14 — Official launch of the Crystal Ship Festival (Previously on Hookedblog) with the work of Belgian artist ROA in Oostende, Belgium. No:13 — Anamorphosis #2 by Elian (Previously on Hookedblog), in Oostende, Belgium. No:12 — Invader takes a bite outta the big apple in New York, USA. No:11 — The work of D*face for the Mural Festival (Previously on Hookedblog) in Montreal, Canada. No:10 — Chilling out on the streets with stencil artist Jef Aerosol in Brussels, Belgium. No:09 — Super fun mural by HuskMitNavn in Charleroi, Belgium. No:08 — Colourful mural for the NuArt Festival (Previously on Hookedblog) by artist Hush on the streets of Stavanger, Norway. No:07 — Crazy and wild collaborative mural by Nychos and Lolo Ys in Brooklyn, USA. No:06 — Typographic freshness on the 3D wall by Steve 'ESPO' Powers for the Coney Arts Wall project (Previously on Hookedblog) in Coney Island, USA. No:05 — Beautiful mural by Bezt from Etam Crew for the Mural Festival (Previously on Hookedblog) in Montreal, Canada. No:04 — Large scale mural by Millo in Milan, Italy. No:03 — Vibrant large scale work by MOMO in New York, USA. No:02 — One of the large scale KAWS works on show at the Yorkshire Sculpture Park in Yorkshire, UK. No:01 — Striking work by Remi Rough for the MB6 Street Art Project (Previously on Hookedblog) as part of the Marrakech Biennale in Marrakech, Morocco. 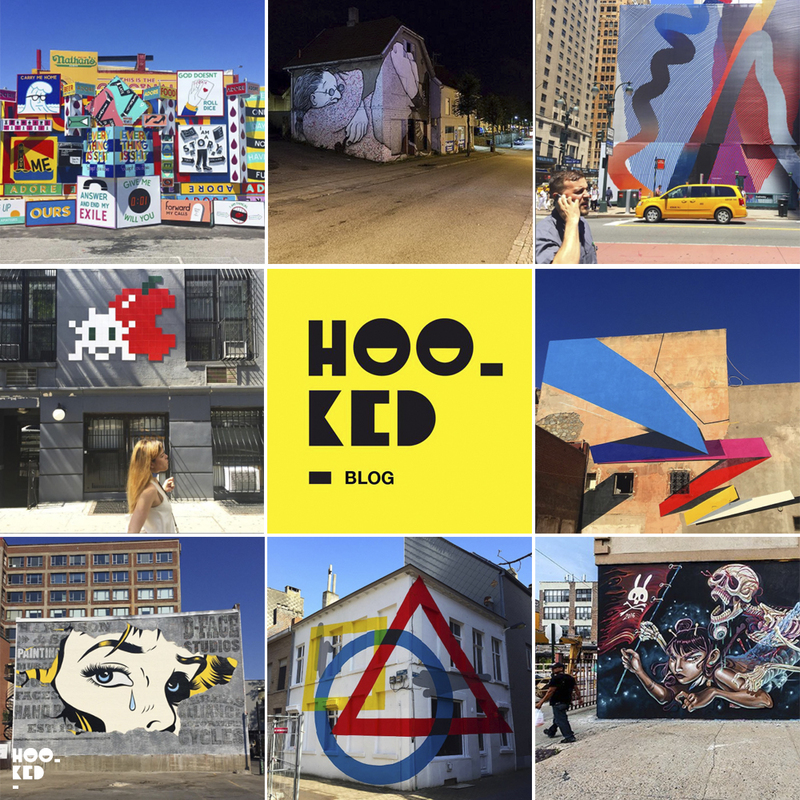 So there you have it, some of our favourite Hookedblog Instagram photographs from our 2016 travels. Let us know what your favourite image is and if you are not already doing so pop over to Instagram and follow us as we start this new year.